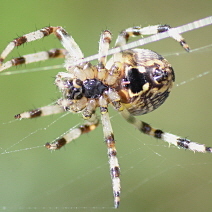 Click on any image below to show an enlarged version. 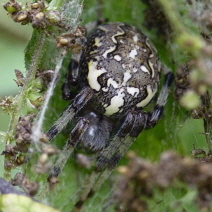 Very variable in its markings with distinctly different varieties. 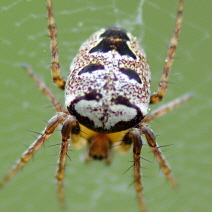 Those pictured show this variability. 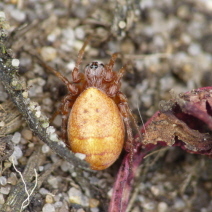 All were photgraphed on Cavenham Heath, Suffolk though I've found the species on a few other sites locally. 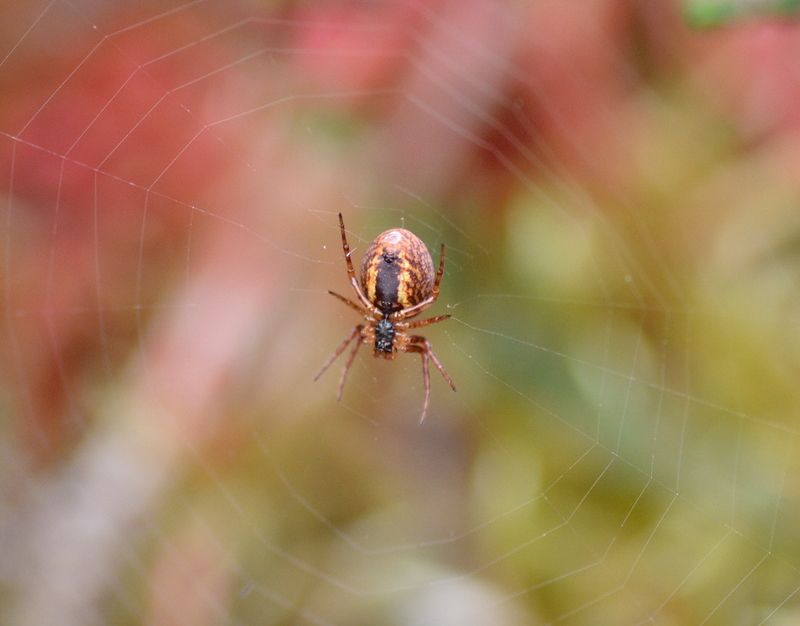 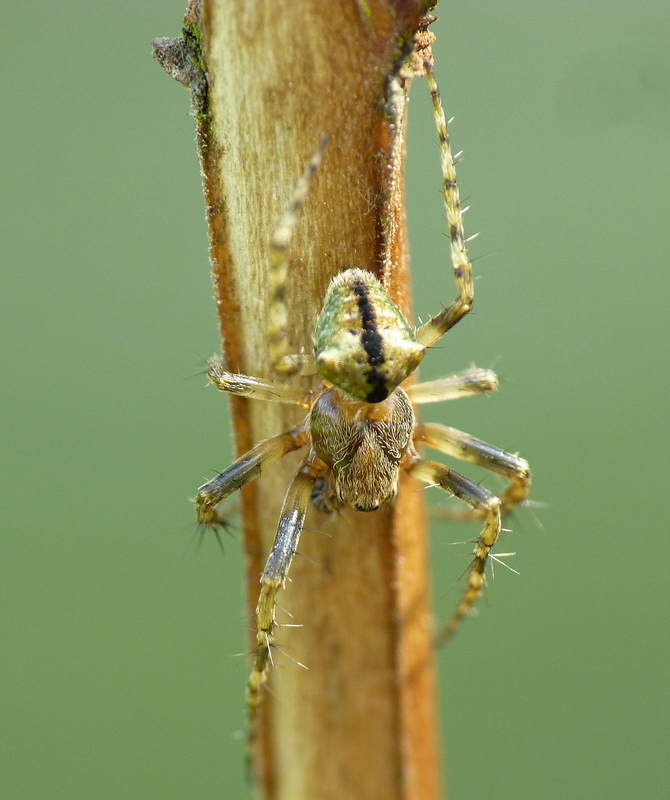 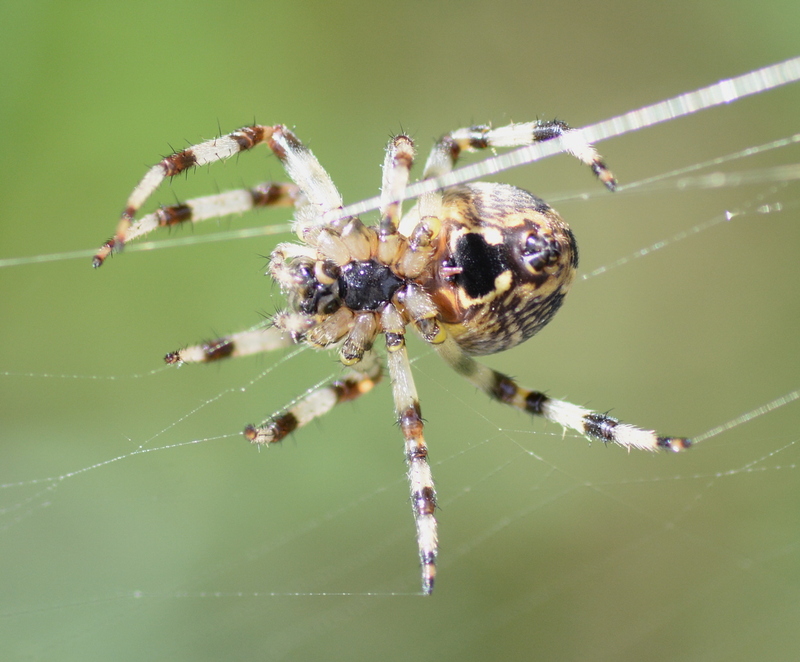 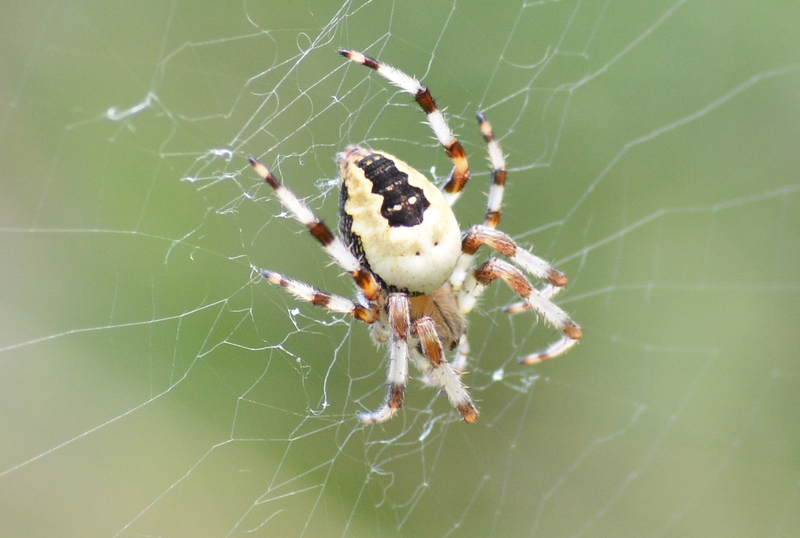 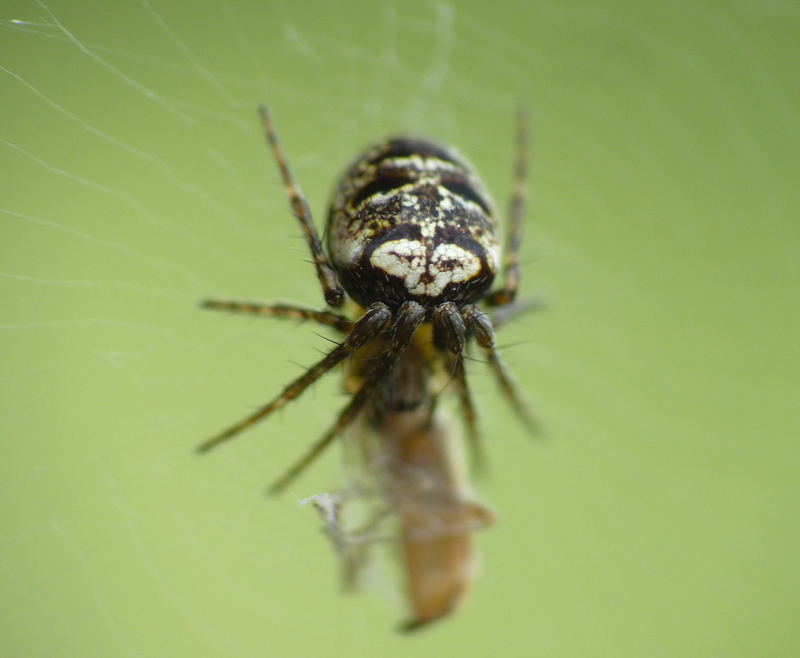 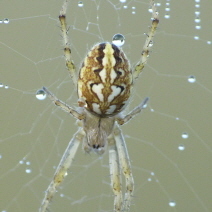 A very common spider in gardens and open countryside. 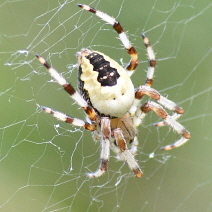 The colour of the abdomen may be brown, reddish or black. 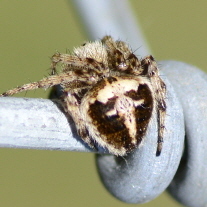 The cross marking may be reduced to a few white spots. 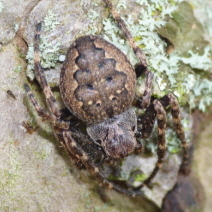 The marmoreus form is generally less common than the pyramidatus one (see below), although I have found places where it is more common. 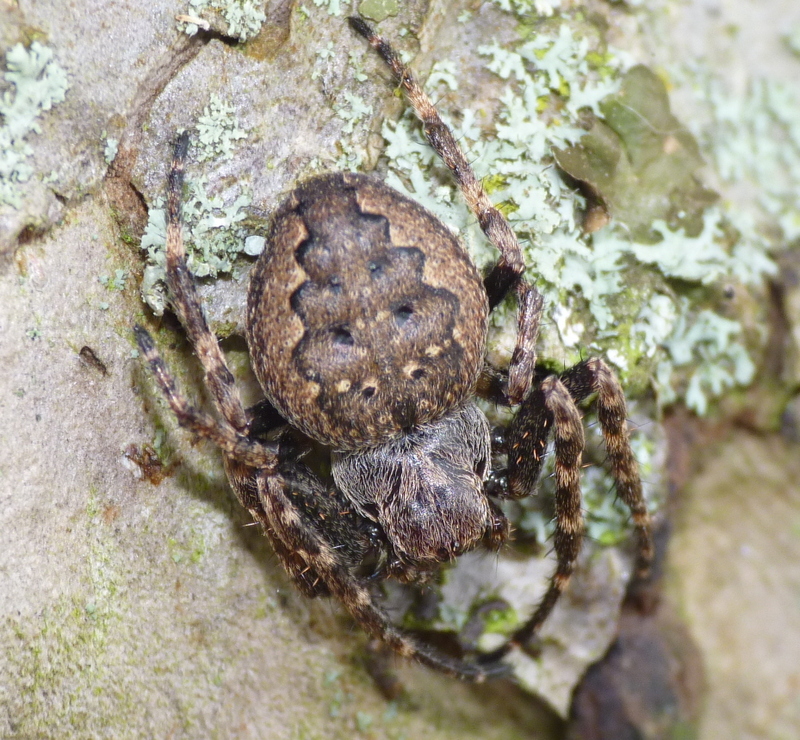 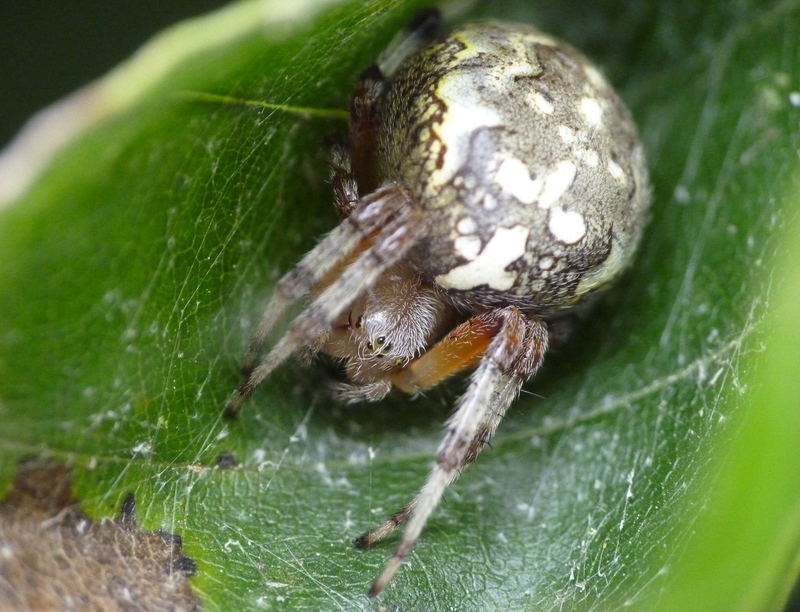 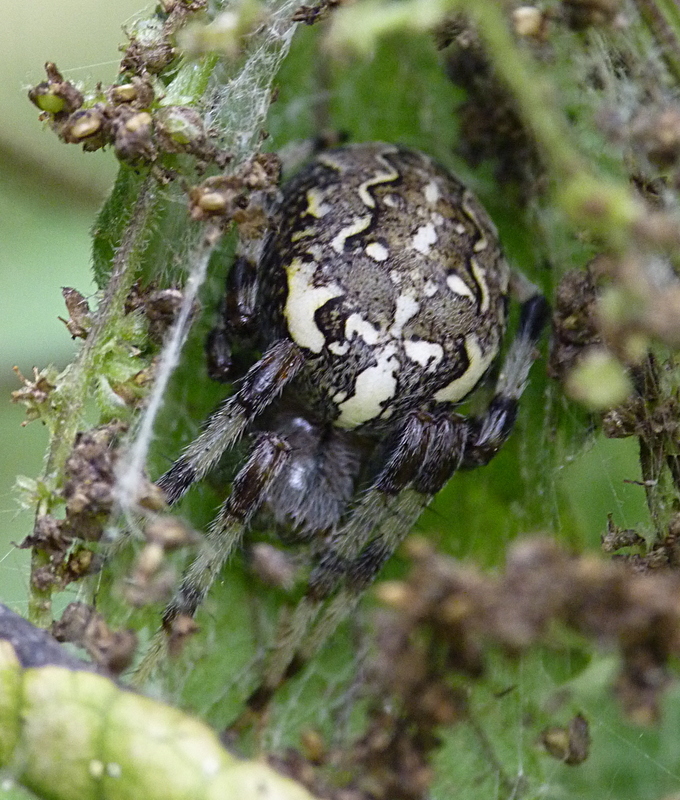 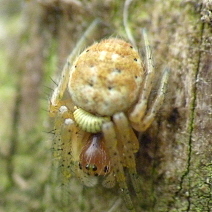 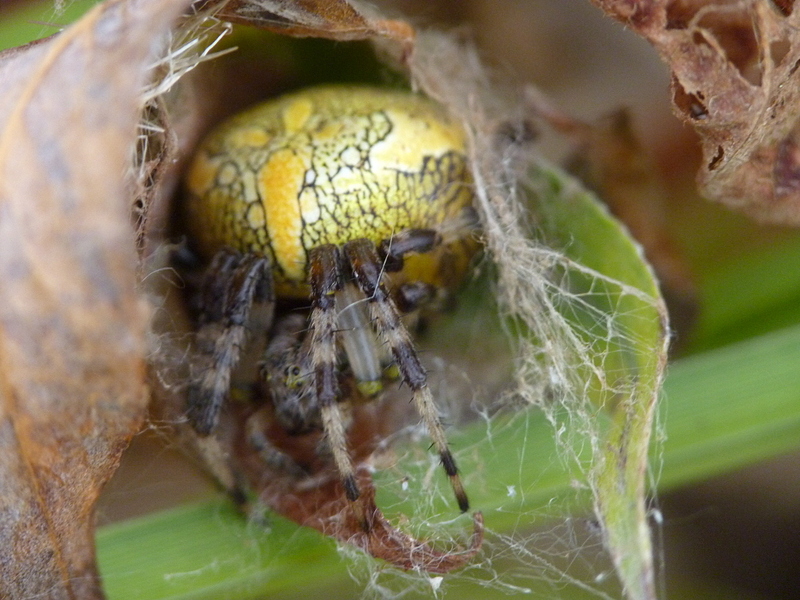 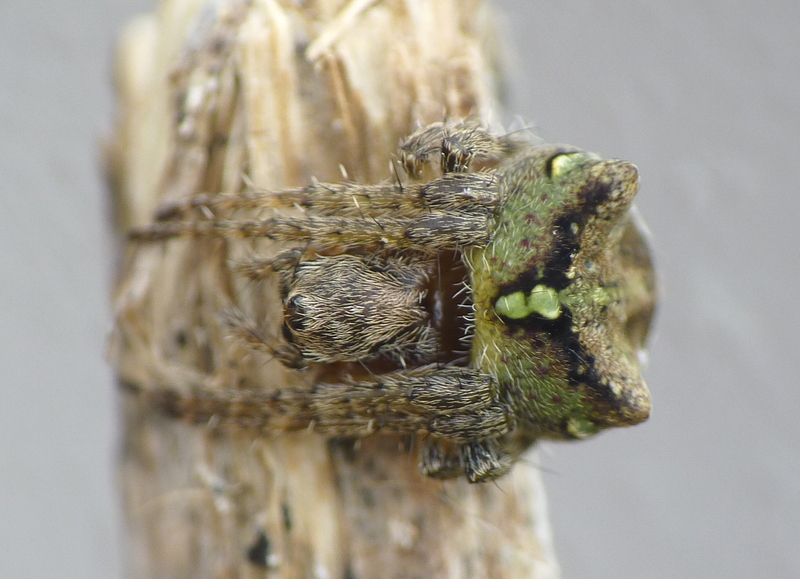 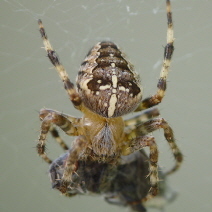 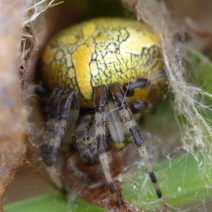 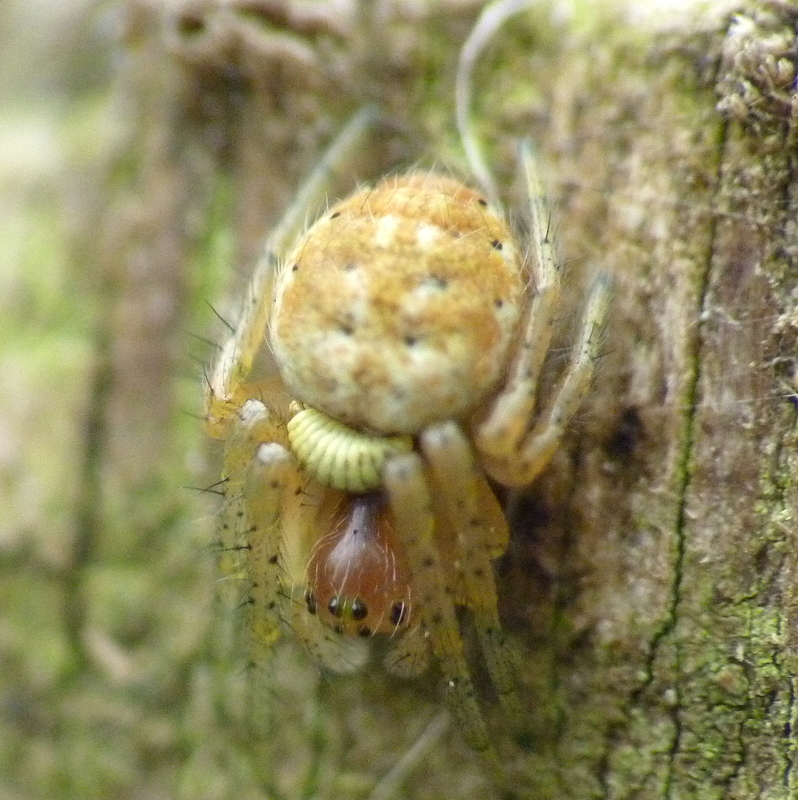 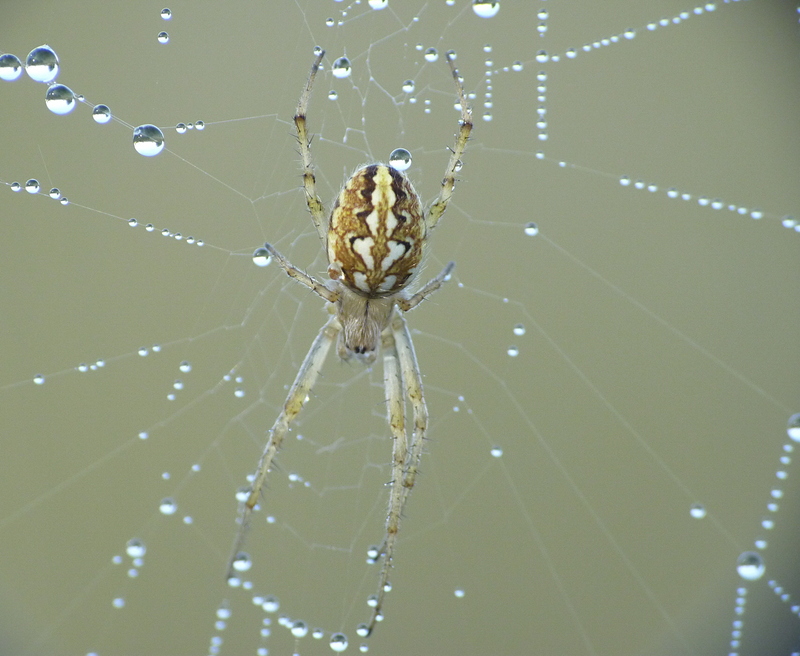 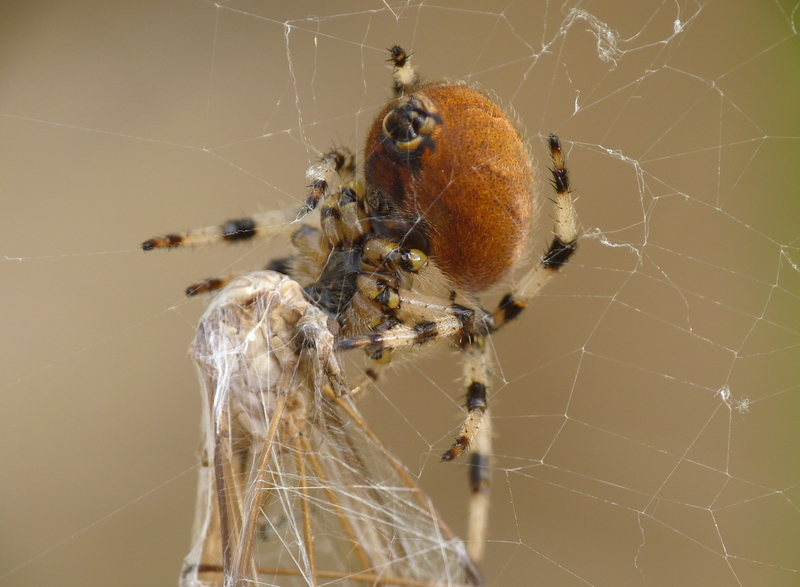 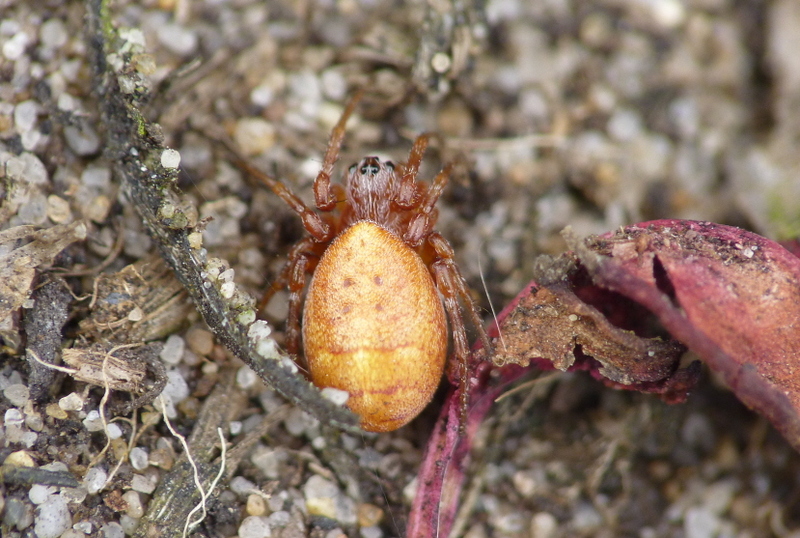 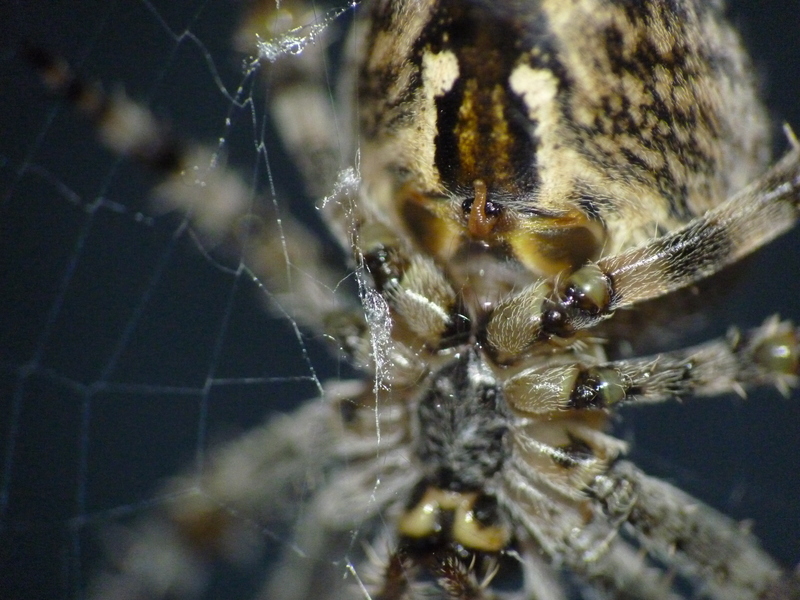 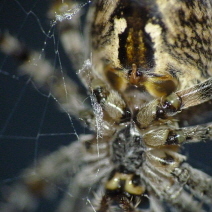 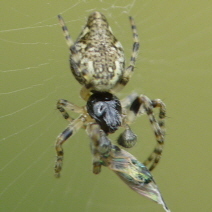 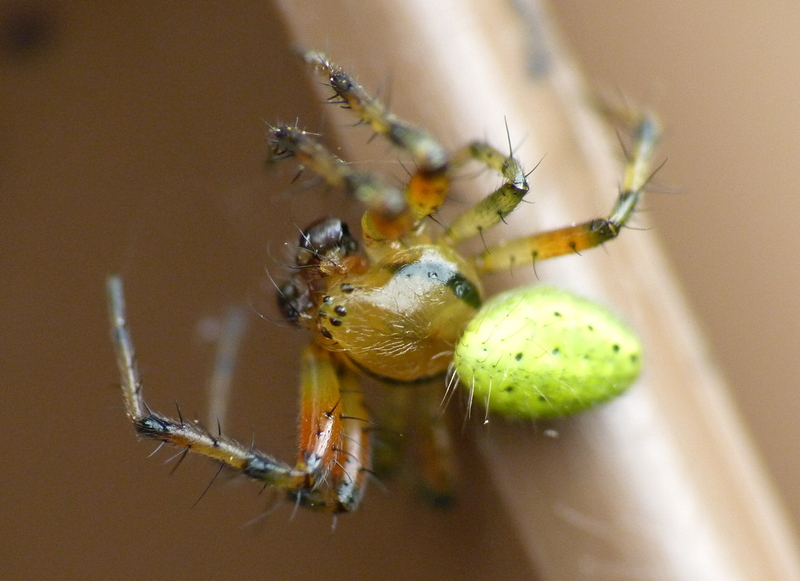 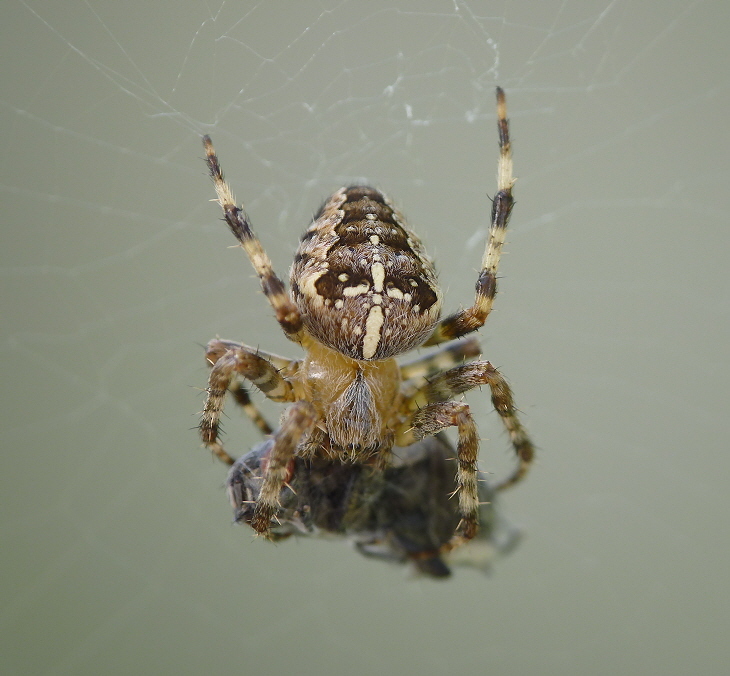 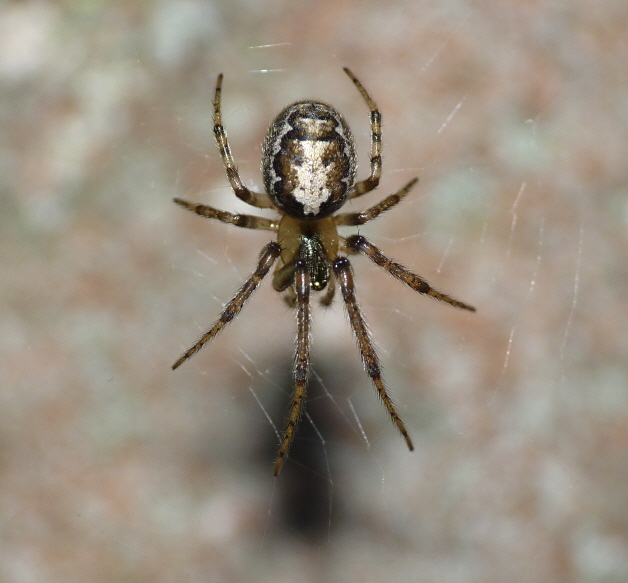 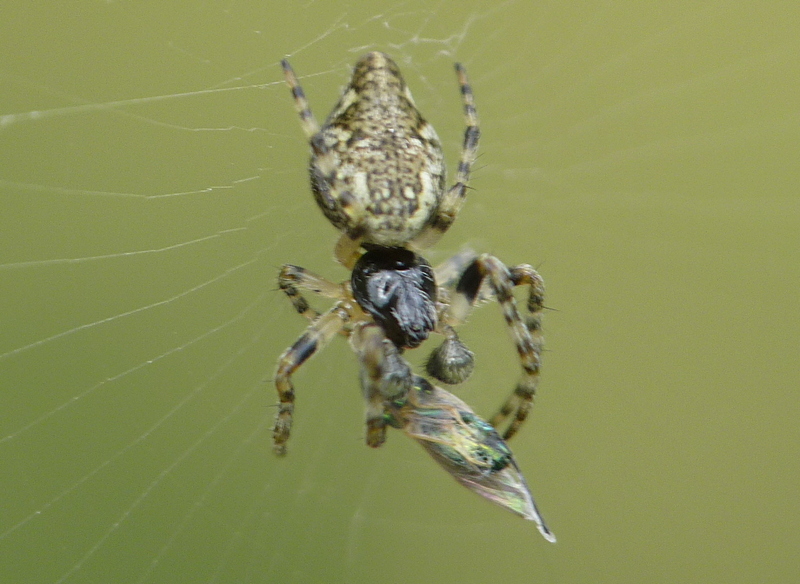 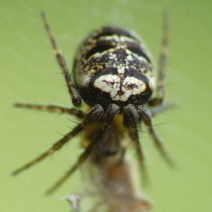 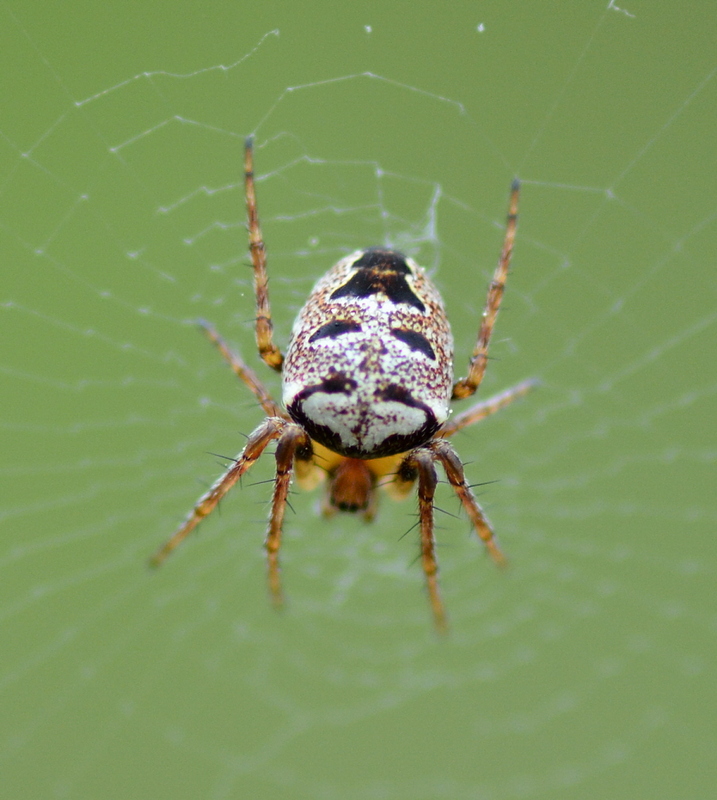 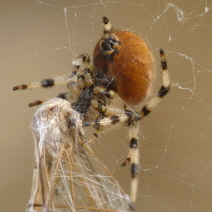 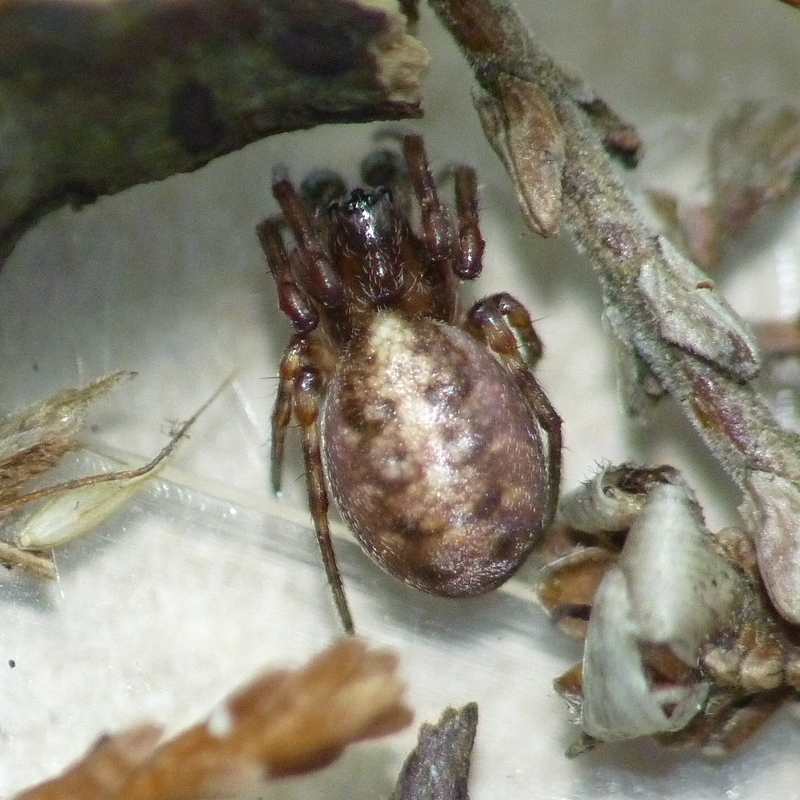 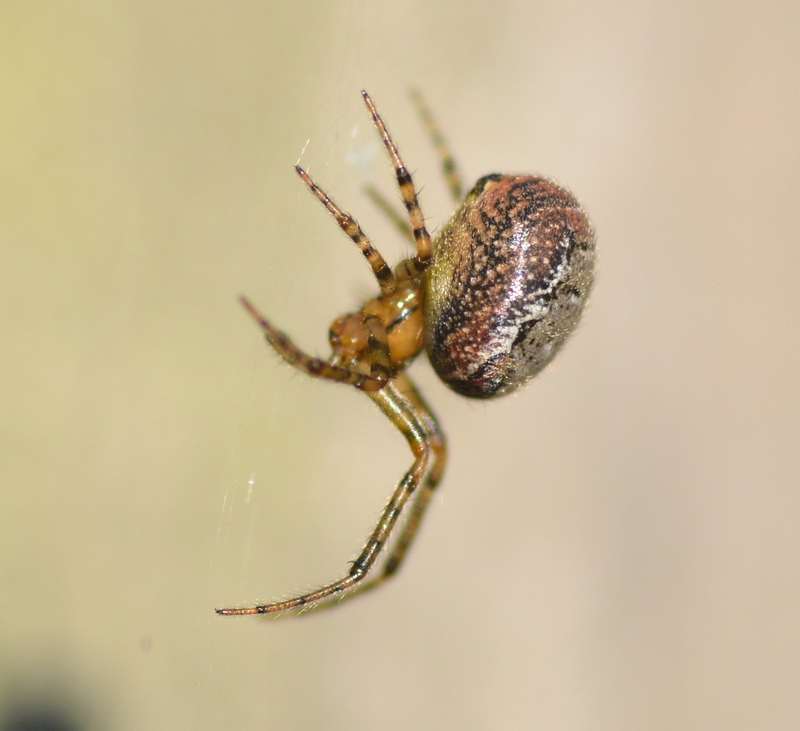 It resembles Araneus quadratus but, whilst that can be dark along the side of the abdomen, it doesn't have the marbling. 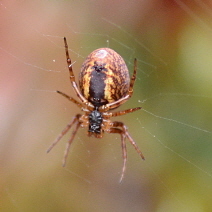 The more common colour form of A. marmoreus. 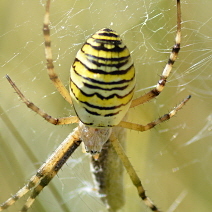 The species can be found in a variety of open and semi-open habitats, such as bramble banks, nettle banks, woodland edges and hedgerows. 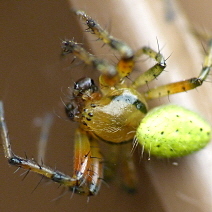 There are a few bright green Araniella species. 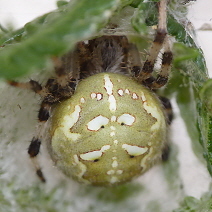 The most common is cucurbitina but identification requires specimens to be examined under the microscope. 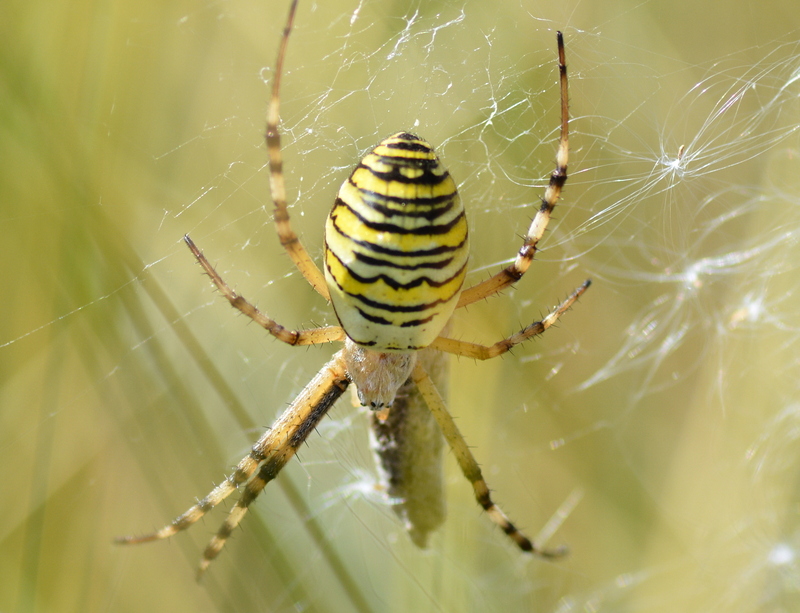 Prior to 2016 I'd only seen Argiope abroad, but then in 2016 saw several at two sites in West Suffolk. 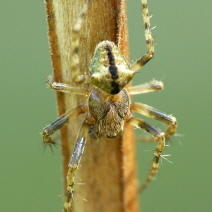 The species is becoming increasingly common here. 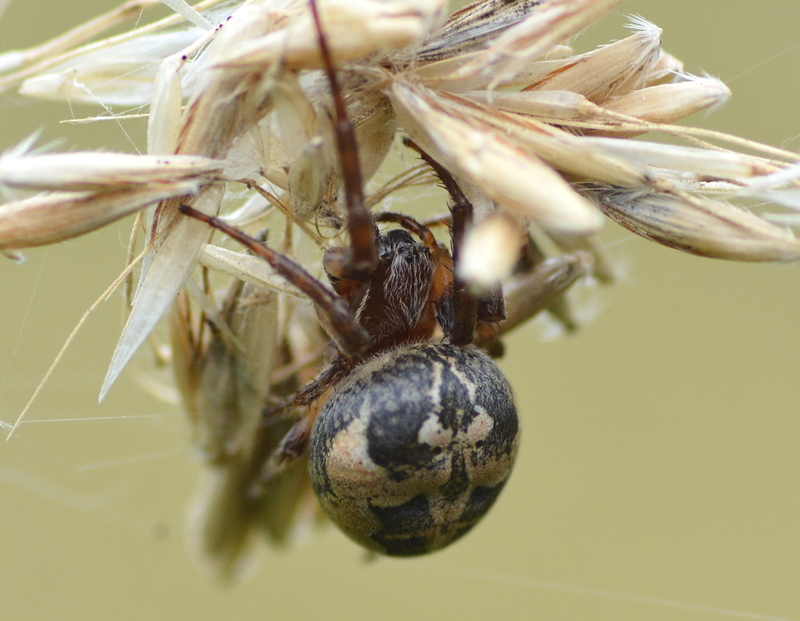 They seem to like areas of thick grass, with lots of grasshoppers for them to eat. 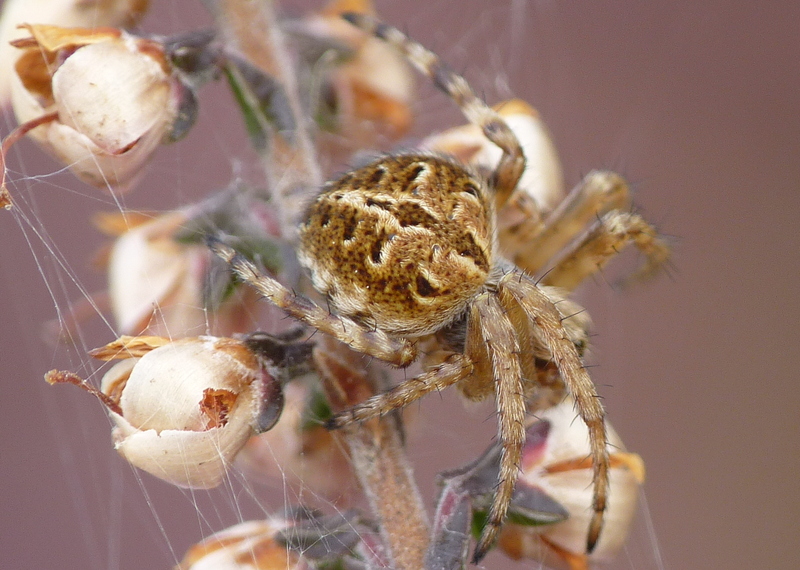 Found low down in heather, thick grass etc. 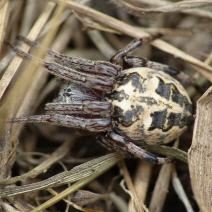 There are a few records from my area but it's not common. 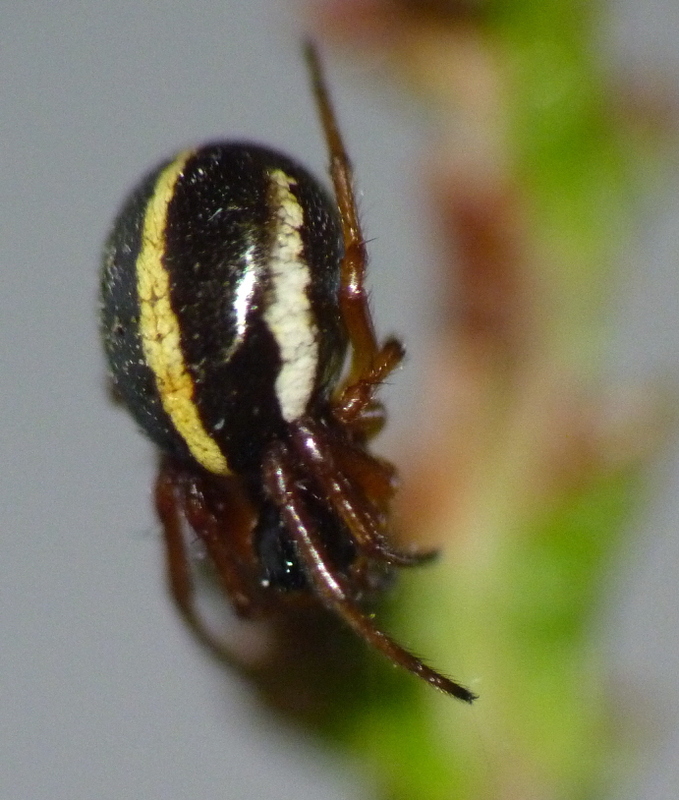 I have found several of this species, on isolated trees or woodland edges. 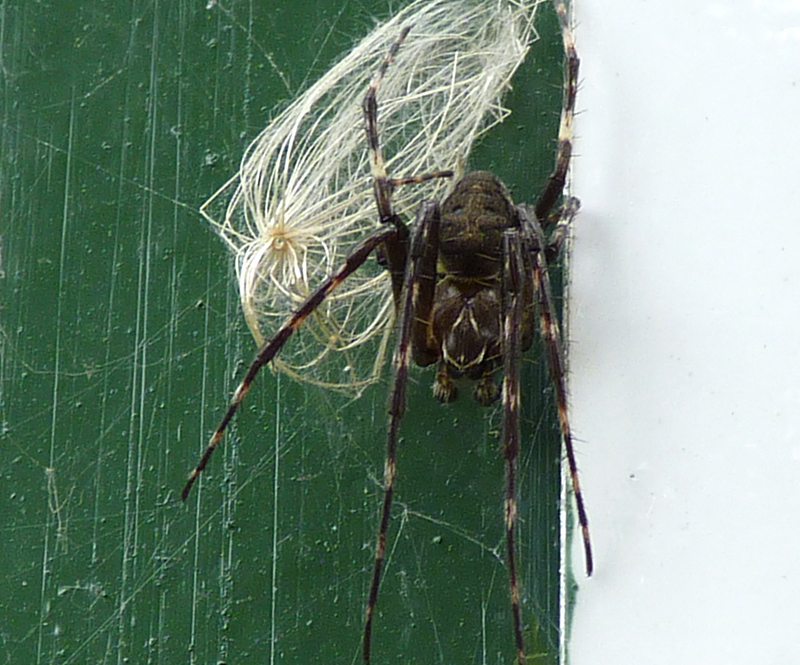 However, I've never found more than one together. 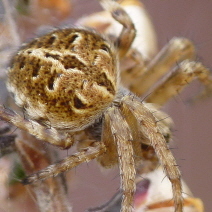 Seemingly widespread but not a species which I've found in large numbers, just occasional ones. 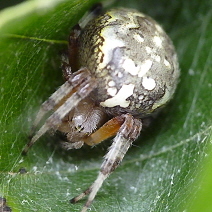 In bushes or trees. 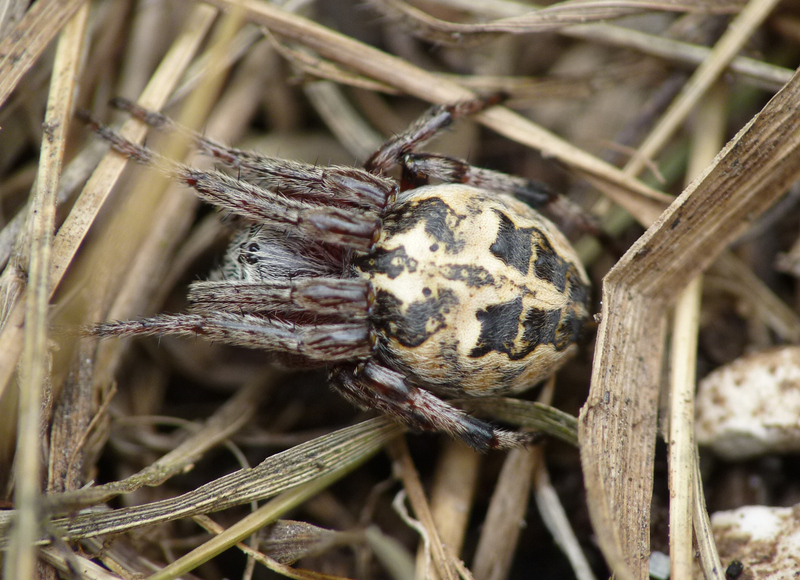 Can be common in open areas, particularly wet habitats such as marshes, riverbanks. 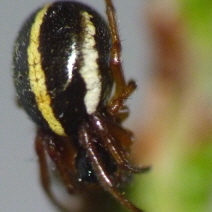 Colour varies slightly, some specimens being rather dark. 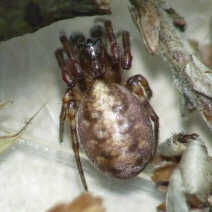 Similar to the above species, but is usually darker. 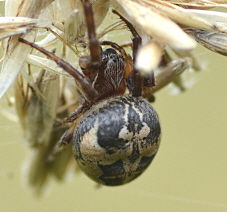 It has different markings to N. umbratica. 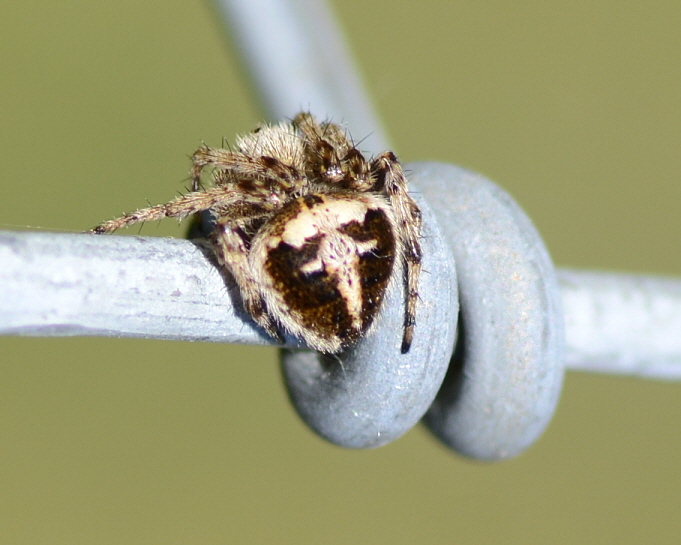 Usually found close to water, on bridges and other structures. 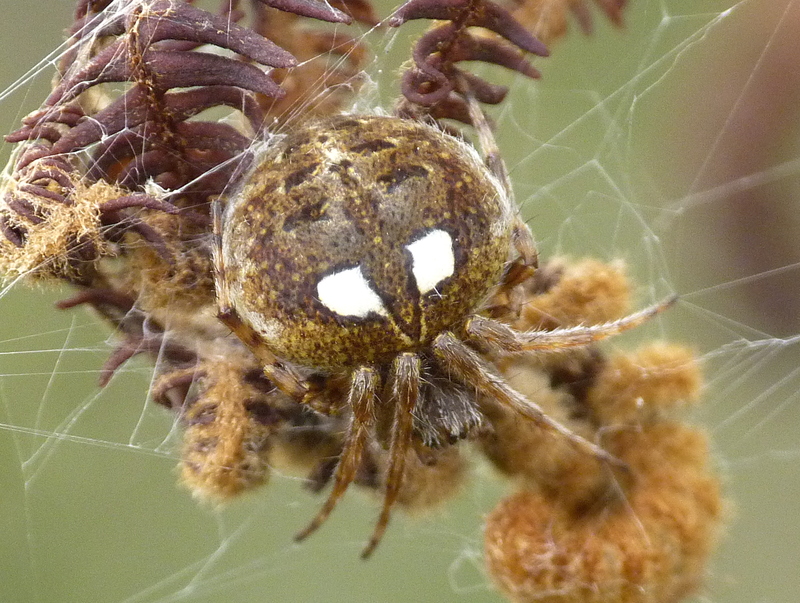 Common at a couple of sites locally, yet it seems to be absent from other sites which seem suitable for it. 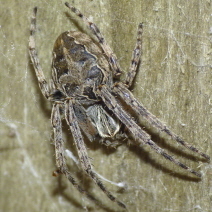 This is a very common species but is nocturnal and therefore few people are familiar with it. 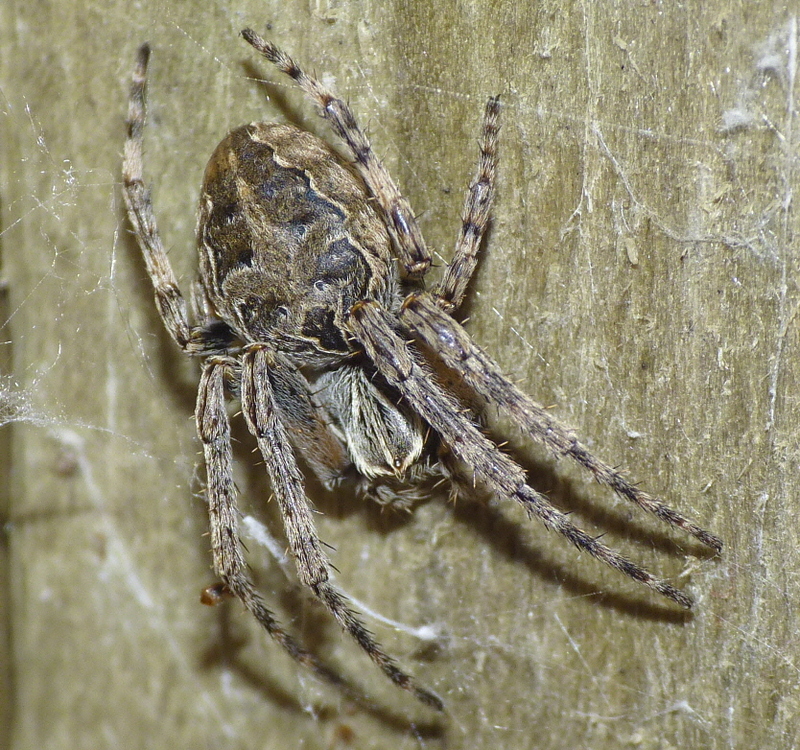 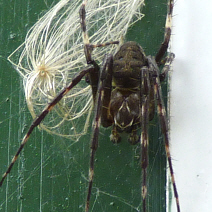 Its flattened body allows it to hide away during the day in cracks in walls, behind bark etc. 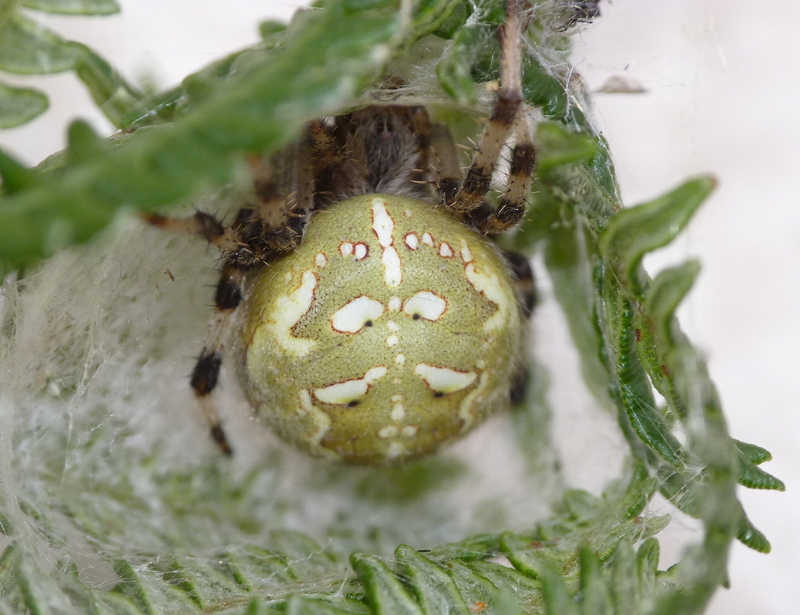 Both photos were taken on Cavenham Heath NNR, one at the base of a birch tree on the edge of the heath, the other in a bramble bush in woodland. 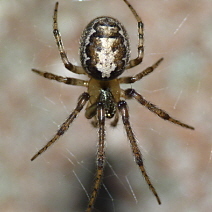 A very common spider, particularly around houses where it is the spider most likely to be found with a web in the corners of window frames. 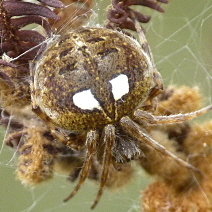 However, it will also build its web in bushes. 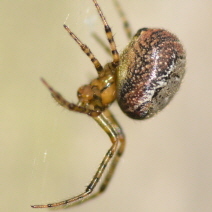 Very similar to Z. x-notata, in size and markings, but the side of the abdomen is generally redder. 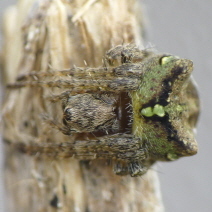 Though common it is less familar than Z. x-notata because it is rarely found in gardens, preferring more open habitats.